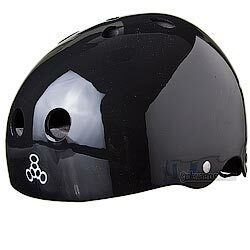 Triple Eight’s Brainsaver Glossy Helmet with Standard Liner has been a favorite of athletes and in the action sports industry in general since 1994. With its multi-impact design, our helmet is ideal for skateboarding, long boarding, inline skating (roller blading), and roller derby use. This helmet is not for bicycle use. •	Ideal for skateboarding, long boarding, inline skating (roller blading), and roller derby. Not for bicycle use. This helmet does not comply with the U.S. CPSC safety standard for bicycle helmets for persons age 5 years and older and therefore cannot be shipped to customers in California. this is an awesome. the couple down sides are that they are a little heavy. and if you fall the paint gets a little scratched up. but overall its a great helmet. GO BUY SOME!!!!!!! !